Early miscues only momentarily slowed Park Hill, who overcame a tough start and pulled away from Smithville for a 35-6 win Friday night at Park Hill District Stadium. "I was impressed with the way Smithville came out in the first quarter, they weren't backing down," Park Hill head coach Josh Hood said. "We came out a little bit slow again and we have to find a way to come out in the first few minutes and set the tone." Time of possession was a big factor in Smithville building the early lead with the Warriors holding the ball for nearly 11 minutes of the first quarter. The opening drive alone spanned six minutes, 45 seconds. That span included Smithville converting third and fourth downs before the drive was capped by a Sam Aviles field goal to make it 3-0. 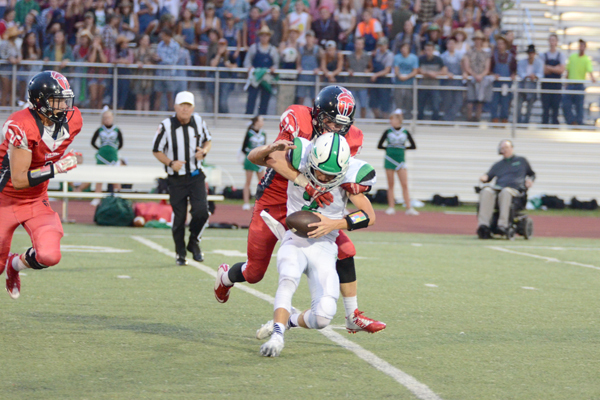 Smithville went to a squib kick on the ensuing kickoff and recovered at the Park Hill 31. The following drive resulted in the Warriors coming up with another field goal and it was 6-0 with just 1:35 to play in the first. With less than eight minutes to play in the half, the home team's comeback began with special teams being the catalyst. A mishandled snap on a Smithville punt set the Trojans up at the Warriors' 6-yard-line. Billy Maples' touchdown pass to DJ Johnson put the Trojans up 7-6 with under seven minutes left in the half. Park Hill added to their lead after another botched Smithville punt gave them possession at the Smithville 2. Trojan running back Zach Neal plunged in from one yard out to push the lead to 14-6 with 1:59 to go in the second. With the momentum now on the Park Hill sideline, the Trojans recovered an onside kick of their own, which led to another scoring strike from Maples to Johnson making it 21-6 at halftime. The Trojans special teams struck again in the third quarter. A fake punt on their first possession of the second half moved Park Hill deep into Smithville territory. Two plays later, Dorian Clayton danced into the end zone and it was 28-6 Trojans. "We're a good football team and I think we showed what we could do there from the second quarter on," Hood said. "We have the athletes this year and we are really going to utilize those guys on special teams. We are happy with the way we conducted business special teams wise and that helped us win the game." Park Hill capped the scoring early in the fourth quarter (11:41) with Clayton's second rushing TD, which put the Trojans up by 29. The Class 5, No. 5 Trojans finished the night with a 253-133 edge in total offense as they moved to 1-1 ahead of next week's matchup at Belton (1-1). Mitchell Orr led Smithville (1-1), who will next travel to Savannah, with 91 yards through the air.